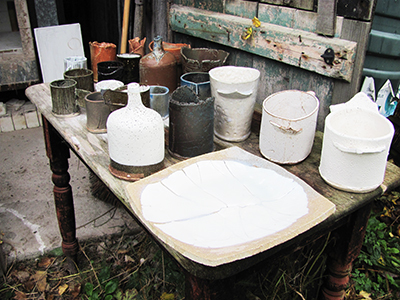 having a huge amount of bisc-fired work in the workshop I have done two glaze firings in rapid succession – and there’s still enough in there to overflow onto the side bench…. but these two firings have given me the confidence at last to see the directions (several) I can keep going in with the new clays and glazes I have been using. 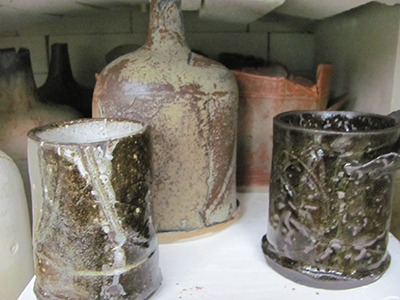 I am finding the Emanuel Cooper delicate chun glaze very good tempered, it seems to be happy to be at the (cool) bottom of the kiln, or at the (hot) top, which is very useful when packing a firing. here it’s on the black clay, at the top of the kiln. this pack is not so good for these big pots, the two at the back would have been brighter and less smoky if they had been at the front. I thought the platter had cracked open when I first saw it, but in fact it’s just the inlaid porcelain that has cracked, during heating up, and the glaze has partially melted into it. I used the Solargil Grés st Amande clay with no additions for the two oval dishes at the back – the colour is quite good, but generally the effect is a bit smooth and bland for me. 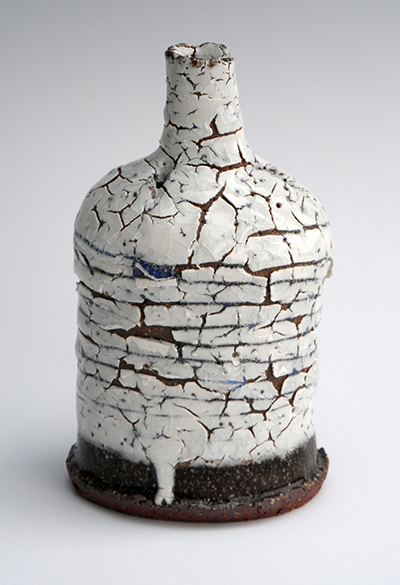 the bottle with the layering and impressions has come out very well with the dolomite blue glaze. I have a lot of these to glaze and fire. 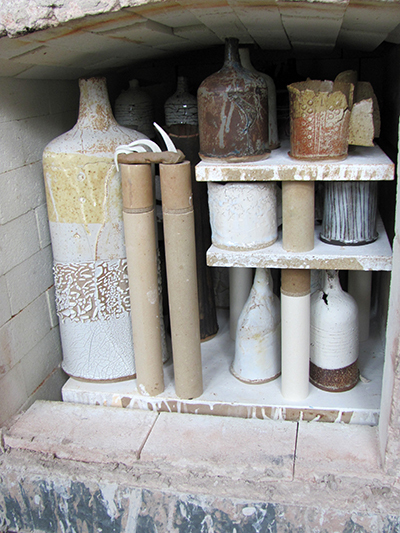 Also I have found a place where the old magnesium crawling glaze will fire without melting too much, and be quite interesting; at the cool front left bottom of the kiln. this is quite a cold spot. 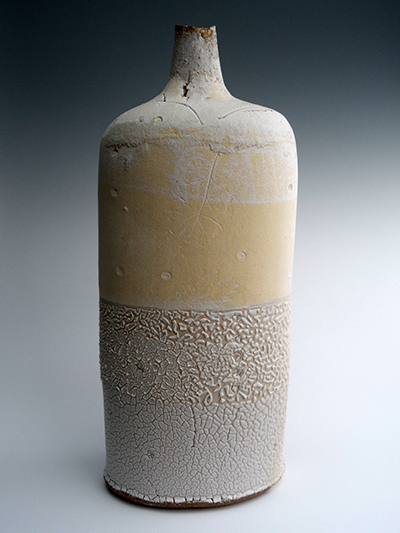 with a pot like this tall bottle which was at the front left of the kiln, having the dry barium carbonate glaze on the top half, overlapped by the magnesium glaze, the overlapping producing even more interesting textures, works very well. 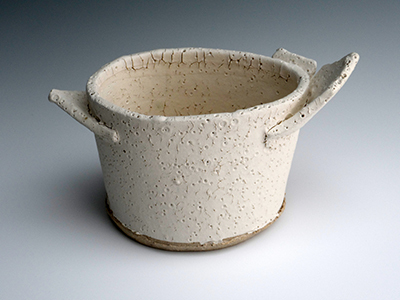 at the top there is enough heat and reduction to bring out some colour in the barium glaze on this grogged white stoneware from Earthstone. unfortunately layering the Earthstone grogged white over their crank seems to be causing some nasty cooling cracks (you can see they occurred on cooling because the edges are crisp) there’s a crack on the back and the front of this one. it will be interesting to see if they get any worse. in future I will use the much more densely grogged potclays crank, which so far has given me no trouble when layered with much more problematic white clays. 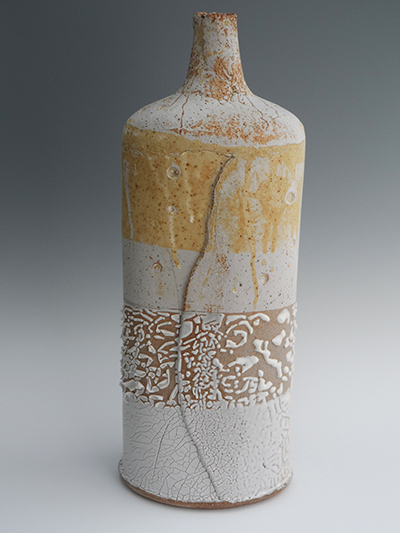 I think this is one of the pieces I made while demonstrating at Hatfield (Art in Clay). 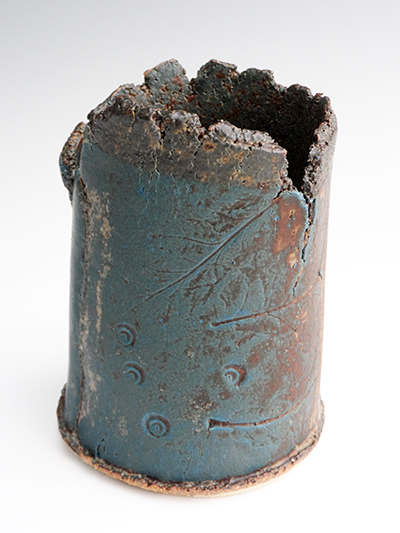 perhaps the extreme dampness caused the 2 clays to lock together in a different way. quite by accident I discovered that the crackle slip is beautiful without a glaze on top. 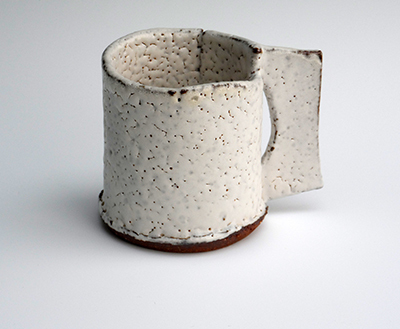 this had been slipped some time ago and it’s not always easy to tell the difference between the slip and the glaze. I am happy to continue doing this! here it is over the black clay and under the chun. this is the reason I went for the chun, I needed a transparent glaze to make the most of the slip. another new clay I have been trying out – Solargil’s Grés de St Amande – which I bought from Micki Schloessingk, the Danish potter who lives on the Gower peninsula. she can supply individual bags of this lovely dense french naturally occurring clay (I bought the grogged version) which has high silca content and organic matter, giving it a dark grey colour when wet. or you can order large amounts to be delivered straight from France through her. For me it is too smooth, and needs more irregular sized grog to be added, which I have been doing, and this little beaker is made from that mixture. 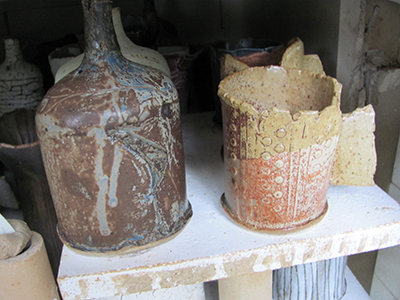 on opening the second firing I was over the moon – until I saw that the large bottle on the left has cooling cracks. 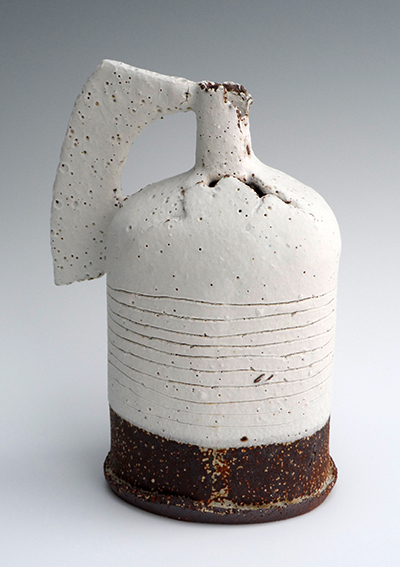 a great disappointment, because I felt this bottle came out even better than the first one. it might be possible to do some japanese laquer repairs, with gold powder, I shall have to see if the pot stays in one piece. 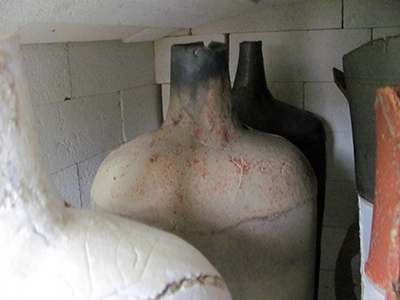 I was a little nervous about opening this firing – the kiln behaved quite oddly; normally reduction slows things down a lot when it gets into the 1200’s C, sticking at 1250 – 60 , but this time it went whizzing up, and cone eleven had only just started to soften at 1277 C when I turned it off. this shelf was just about touching the front wall – so maybe it was that – anyway, it was a different pack from the last one, with quite a dense arrangement of small pieces in the back. 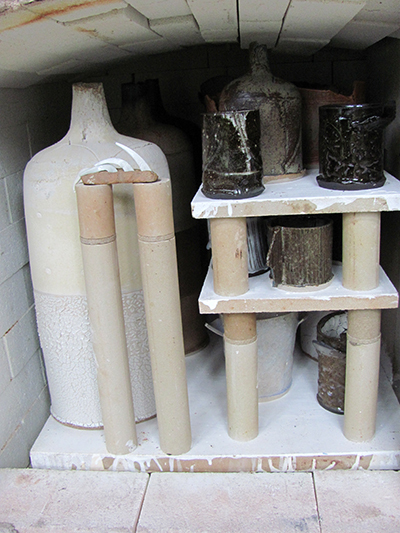 no harm was done, it was a good firing – and it didn’t keep me up half the night! 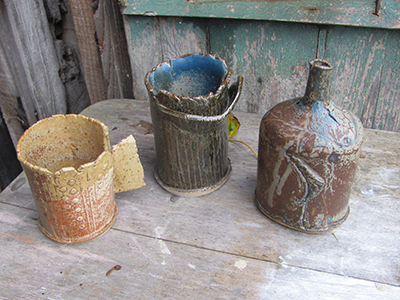 two porcelain pieces with the Emanuel Cooper barium satin glaze picked up a blast of copper vapour. 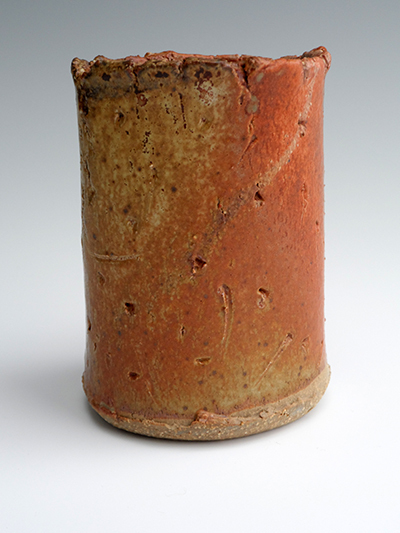 the copper in the green/orange dolomite glaze reduced beautifully and slightly vaporised out on this beaker on the left. 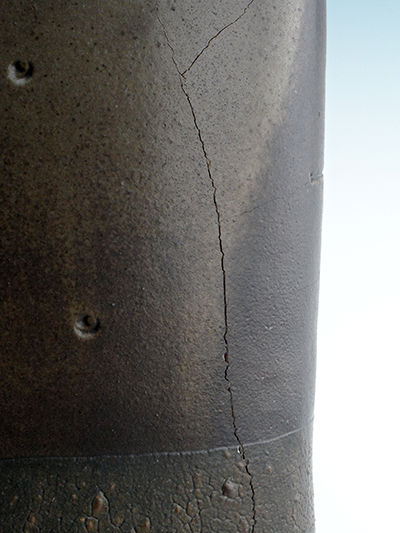 here is the sad cracked bottle. I had started to glaze it with the dolomite glaze, washed it all off, and then had a bit of a battle with it, as I didn’t stir the barium glaze up enough and the first time it came up with great blobs of clotted cream consistency and had to have the top washed off again. the dampness caused some nice difference in thicknesses which give the yellow ochres and the washed out runs on the top. this is the one I made on the saturday at Hatfield. 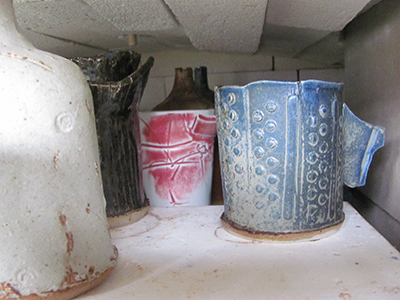 I certainly have to make some more, perhaps just from the grogged, white, no layering. back to the chun and the crackle slip. I would like to find a shorthand phrase for this combination, as in the “saltmarsh” series, I’m really fed up with continually writing chun over crackle slip etc, something like ice melt or frozen snow. 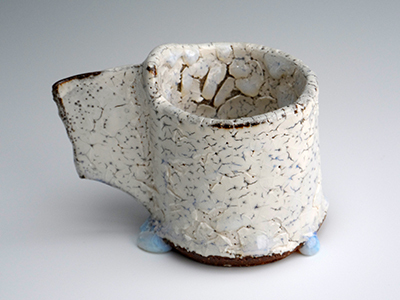 anyway, this one and several others I slipped after bisc firing and then scored, with interesting results, and the optical blue from bubbles in the glaze has got quite dark over the “pink” stoneware. I tried the dry barium glaze (40% barium carbonate, 60% china clay – don’t try this at home, it is basically rat poison, it gives you convulsions and respiratory failure if you ingest it) over the crackle slip. might as well not use the poisonous nasty glaze, there’s very little difference. 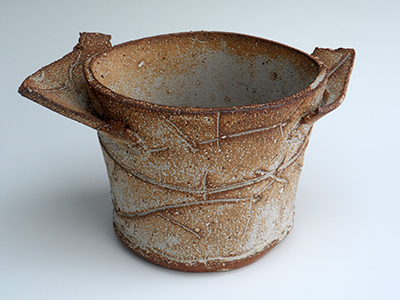 Emanuel cooper’s satin-matt glaze (with 20% barium carbonate) is really lovely over the crackle slip. it is translucent, so really is best over porcelain or white slip. 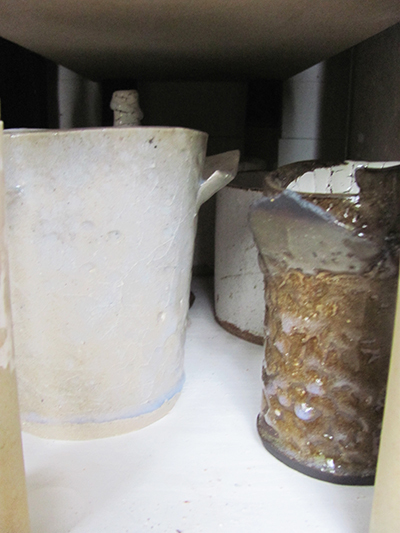 however that dry barium glaze is very useful, and I have an enormous dustbin full of it to use. here over the “pink” stoneware it has taken up a lot of the clay body colour. it doesn’t always, see no 22 of the first firing, and 18 of the second here where the glaze stays a lot greyer than the body. two firings containing much food for thought and the impetus to make more … but that will have to wait until December now. 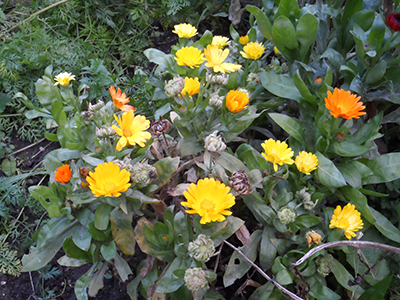 now we are half-way through October and the first frosts are threatening, the garden is still full of colour though a little bedraggled. 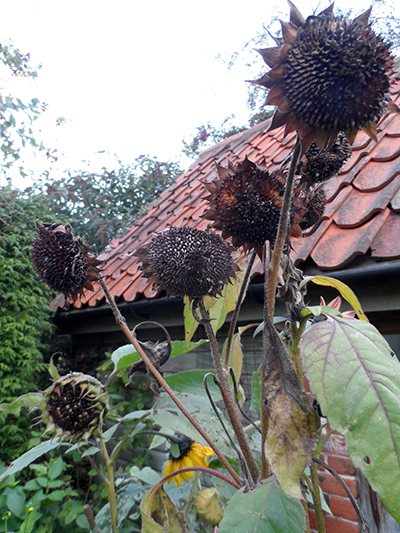 sunflowers and echinaceas have great heads remaining – I must pick the echinaceas for dried flowers. the birds love the sunflowers of course. 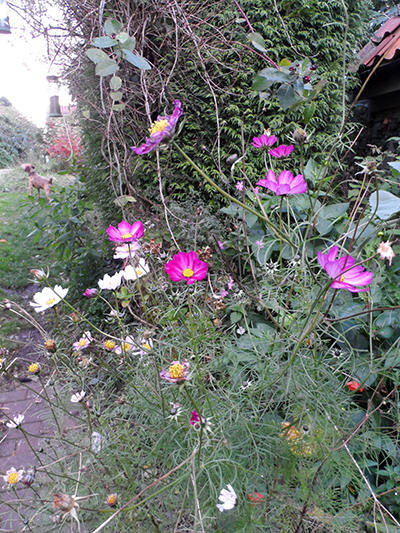 the cosmos have just kept on flowering – they are in a shallow pot, and they really seem to like it. Em ( see little dog in background) dug it out for the chicken poo pellets in the spring – I can’t remember if it was the comos seeds he dug up, or if I re-seeded it with them. they also seem to be slug and snail proof. 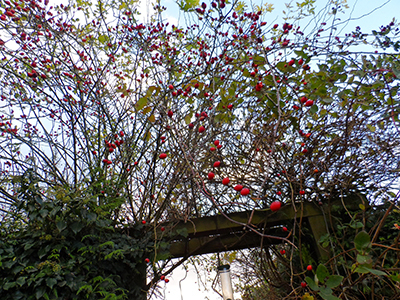 a fantastic show of dog-rose hips this year. all the roses flowered well and this wild rose has got enormous, blocking a lot of light from the flower garden. 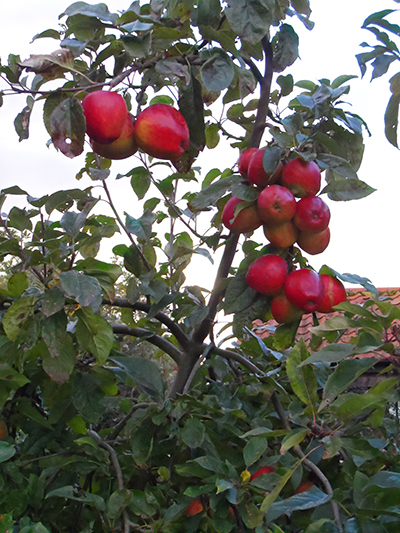 it will have to have a big prune this winter. 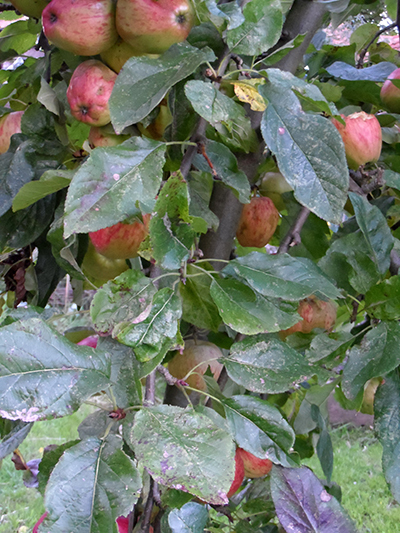 I really thought I wouldn’t get a crop of apples at all this year, there was late frost and the blossom all seemed to be soaking wet all spring; I saw no bees on it at all, and then the emerging apples seemed to be strangely pockmarked and distorted – but this Saturn is weighed down almost as much as ever with huge juicy crisp apples. 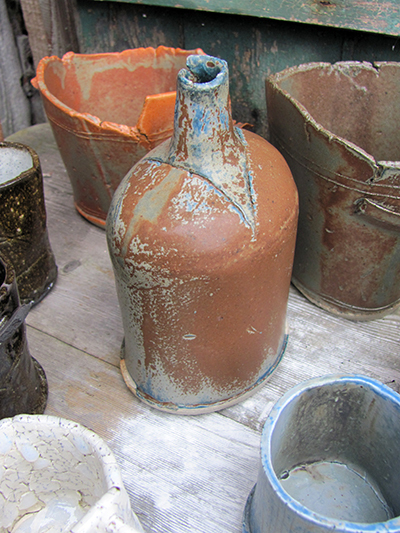 they keep until March, stored in the shed away from the mice. some dark red, some stripey …. 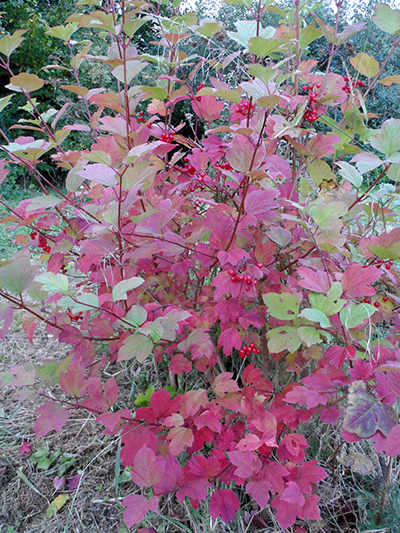 several different varieties. 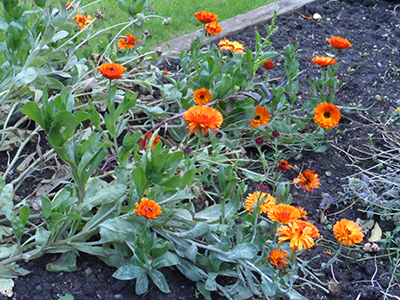 and by starting them in pots I was able to keep them away from marauding rabbits and gastropods. 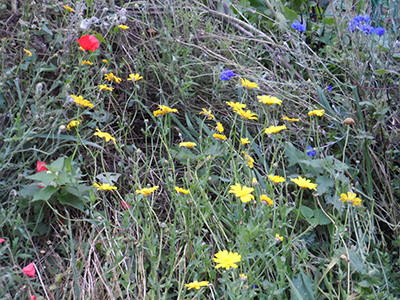 this lot of wildflowers, though leaning all over the bean patch, have been good value too; cornflower, and corn marigold still going strong.